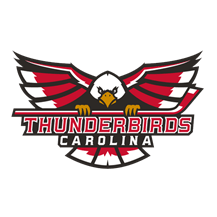 Elmira, NY – The Carolina Thunderbirds got themselves on the right foot to start the first of three straight games on the road, downing the Elmira Enforcers in front of an FHL record crowd 2-1 on Friday night. The loud Elmira crowd got to celebrate first as the Enforcers’ Stepan Timofeyev scored his first of the season on the power play to give the home team a 1-0 lead early in the second period. The goal snapped a streak of 21 straight successful penalty kills by the Thunderbirds. Later in the second period the Thunderbirds struck back with a power play tally of their own as Stanislav Vlasov teed one up from 10 feet inside the blue line and found the net over Troy Passingham’s right shoulder. It was Vlasov’s second goal of the 2018-19 season. The final frame proved the difference in this one as Peter Cicmanec was the end recipient of some pretty one-touch passing by the Thunderbirds and gave Carolina the lead for good. Cicmanec’s first goal as a Thunderbrids goes down as the game winner with about 5 minutes left to play. This was not to say Elmira didn’t have their chances though. With about 2 minutes to go in the third period Dominik Fejt was called on a major penalty for boarding and the Thunderbirds were faced with the propsect of killing off the reaminder of the game to secure the win. About 30 seconds later Jiri Pargac provided some grit behind the net and drew a tripping call against Mike Chemello that evened things up at 4-on-4 for the remainder of the game. Elmira would be able to pull the netminder with around 30 seconds left in the contest and on the final faceoff Joe Cangelosi blocked a drive from Sean Reynolds as time dwindled down. Henry Dill got the win for Carolina stopping 18 of 19 shots he faced to move his record to 4-1. Troy Passingham picked up the loss stopping 32 of 34 shots against him. The two teams meet again on Saturday night 7:05 P.M. in First Arena.